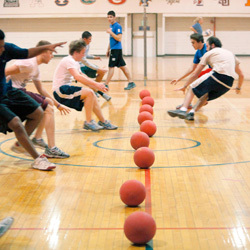 The game of dodgeball is typically played in a gymnasium or on the playground. Ideally the size of the court is as big as a volleyball court. Teams of six to ten players will split up on to two sides. 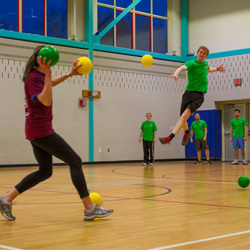 The object of dodgeball is to eliminate everybody on the opposite team by throwing a rubber ball at them. There is a centre line, which nobody is allowed to cross, so you have to throw the ball from your side of the court. If a player gets hit with the ball, then they are out. But, if a player catches the ball, then the person who threw the ball is out. 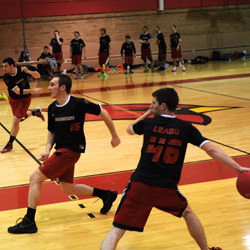 This game can become a exciting competitive event that demands a great measure of power and accuracy. This exciting addition to Xtreme Scene can be played up ton 50 people at any given time making it a wonderful game for big cooperates and holiday clubs.